I am an assistant professor at École des Ponts ParisTech, and a researcher within the Applied Probability team of CERMICS. Forthcoming event: conference PDE/Probability Interactions: Particle Systems, Hyperbolic Conservation Laws at CIRM, 14-18 October 2019. 2A IMI/SEGF: Statistiques et analyse de données (page du cours sur Educnet). 3A GMM, M2 DMSE: Ingénierie des incertitudes en mécanique (page du cours sur Educnet). 1A: Probabilités (page web du cours). 2A: Processus stochastiques, Processus stochastiques avancés. Long time behaviour of stochastic processes: convergence to equilibrium, metastability. Interacting particle systems and particle methods for nonlinear PDEs. Equilibrium and nonequilibrium statistical mechanics, large deviations, rare events. Applications of probability theory and analysis to physics, economics and operations research. Uncertainty quantification and industrial applications. I am involved in the organisation of CERMICS' colloquium and applied mathematics seminar, and I regularly take part in the activities of the MSMath ERC project. I am a member of the ANR project EFI (2017-2020). Since 2017: Adrien Touboul, with Bernard Lapeyre at CERMICS and Pierre Benjamin, Fabien Mangeant and Mouadh Yagoubi at IRT SystemX: Uncertainty propagation in a graph of models. Since 2017: Mouad Ramil, with Tony Lelièvre at CERMICS: Metastability, interaction and nonlinearity. Since 2016: Sofiane Martel, with Sébastien Boyaval at LHSV: Finite volume approximation of the invariant measure of stochastic scalar conservation laws. S. Cazeau, M. Toulemont, P. Ritter, J. Reygner, Statistical ranking of electromechanical dyssynchrony parameters for CRT, Open Heart, 6:e000933, 2019 (complement). T. Lelièvre, L. Pillaud-Vivien, J. Reygner, Central Limit Theorem for stationary Fleming–Viot particle systems in finite spaces, ALEA Latin American Journal of Probability and Mathematical Statistics, 15:1163-1182, 2018 (arXiv:1806.04490). J. Reygner, Equilibrium large deviations for mean-field systems with translation invariance, Annals of Applied Probability, 28(5):2922-2965, 2018 (arXiv:1706.08780, complement). F. Bouchet, J. Reygner, Generalisation of the Eyring–Kramers transition rate formula to irreversible diffusion processes, Annales Henri Poincaré, 17(12):3499-3532, 2016 (arXiv:1507.02104). B. Jourdain, J. Reygner, Optimal convergence rate of the multitype sticky particle approximation of one-dimensional diagonal hyperbolic systems with monotonic initial data, Discrete and Continuous Dynamical Systems - Series A, 36(9):4963-4996, 2016 (arXiv:1507.01085). B. Jourdain, J. Reygner, A multitype sticky particle construction of Wasserstein stable semigroups solving one-dimensional diagonal hyperbolic systems with large monotonic data, Journal of Hyperbolic Differential Equations, 13(3):441-602, 2016 (arXiv:1501.01498). J. Reygner, Chaoticity of the stationary distribution of rank-based interacting diffusions, Electronic Communications in Probability 20(60):1-20, 2015 (arXiv:1408.4103). B. Jourdain, J. Reygner, Capital distribution and portfolio performance in the mean-field Atlas model, Annals of Finance 11(2):151-198, 2015 (arXiv:1312.5660). B. Jourdain, J. Reygner, The small noise limit of order-based diffusion processes, Electronic Journal of Probability 19(29):1-36, 2014 (arXiv:1307.0490). B. Jourdain, J. Reygner, Propagation of chaos for rank-based interacting diffusions and long time behaviour of a scalar quasilinear parabolic equation, Stochastic Partial Differential Equations: Analysis and Computations 1(3):455-506, 2013 (arXiv:1211.4818). A. Gaudillière, J. Reygner, Sampling the Fermi statistics and other conditional product measures, Annales de l'Institut Henri Poincaré : Probabilités et Statistiques 47(3):790-812, 2011 (arXiv:0911.4565). O. Durand de Gevigney, F. Meunier, C. Popa, J. Reygner, A. Romero, Solving coloring, minimum clique cover and kernel problems on arc intersection graphs of directed paths on a tree, 4OR - A Quarterly Journal of Operations Research 9(2):175-188, 2011 (arXiv:0902.1182). J. Reygner, Long time behaviour and mean-field limit of Atlas models, ESAIM: Proceedings and Surveys (Journées MAS 2016 de la SMAI - Phénomènes complexes et hétérogènes), 60:132-143, 2017 (arXiv:1705.08140). J. Reygner, Merveilles du monde unidimensionnel : lois de conservation et transport optimal, MATAPLI 108:103-122, 2015. F. Bouguet, F. Malrieu, F. Panloup, C. Poquet, J. Reygner, Long time behavior of Markov processes and beyond, ESAIM: Proceedings and Surveys (Modélisation Aléatoire et Statistique - Journées MAS 2014), 51:193-211, 2015 (arXiv:1507.05801). 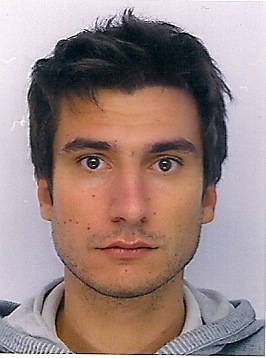 During the academic year 2014-2015, I was a CNRS postdoctoral fellow at Laboratoire de Physique in ENS de Lyon, within the Climate and Statistical Mechanics group coordinated by Freddy Bouchet. I defended my Ph.D. thesis at Université Pierre et Marie Curie in 2014 (see a short summary here). My advisors were Benjamin Jourdain and Lorenzo Zambotti. This work was awarded the Prix de thèse Jacques Neveu 2014 by the group MAS of SMAI. I am an Ingénieur des Ponts, des Eaux et des Forêts and a former undergraduate student of École Polytechnique. My ORCID ID is 0000-0002-7005-0957, and my Google Scholar profile is here. Meeting Uncertainty quantification in materials science, Institut Henri Poincaré, on 14 May 2018. SMAI-BOUM project Fluctuations dans les systèmes de particules, Institut Henri Poincaré, on 21-22 March 2016. Workshop Statistical mechanics and computations of large deviation rate functions in Centre Blaise Pascal at ENS de Lyon, on 16-19 June 2015. Groupe de travail Transport thermique at CERMICS and Inria Paris-Rocquencourt, from 2012 to 2014.